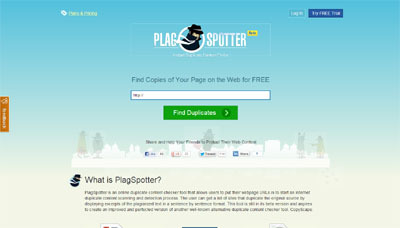 PlagSpotter is a simple and useful tool to check websites for duplicate content. Users are able to insert sites’s URL to find out if content of this site is being used somewhere else. It especially useful for bloggers and writers who watch out for copyright of their publications. It is also good for webmasters who control content flow on their sites, since Google is penalizing sites who are caught on posting duplicate content. It is free. Requires no registration or software downloads.